GARDEN OF LAMENTATIONS, Kincaid/James #17, came in at 130,000 words, and exactly (weirdly) 600 pages in manuscript. (I write in Courier, so that's a big pile of paper.) It was the next to longest book I've written, and I certainly didn't start out intending that. If I'd foreseen it, I'd have stuck my head in the sand in terror at the very beginning... But it was a complicated story, and all the parts had to be played out or everyone--especially me--would have felt cheated. 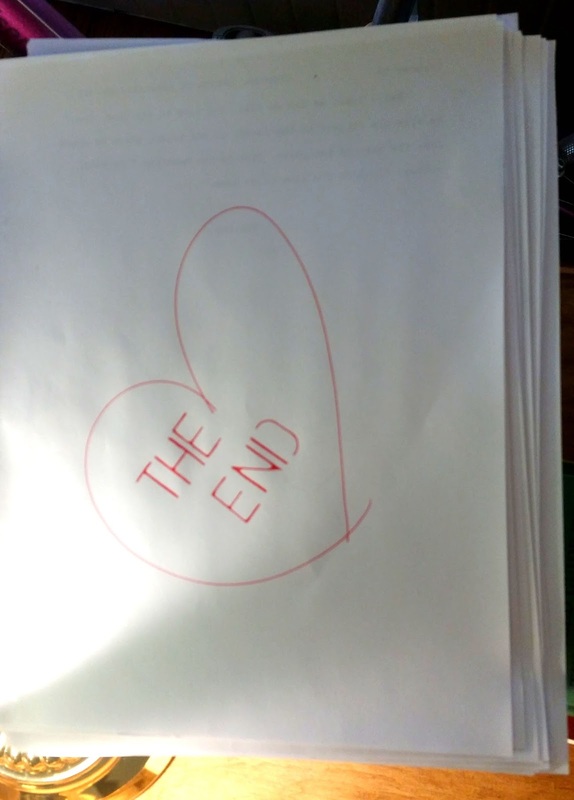 And...as thrilled as I was to get to the end (not to mention the off-the-scale thrilled-ness of my agent and editor), in a way I hated to let the book go. I've spent two years (eek) with this story and these characters. I loved the story, and I love my characters even more. 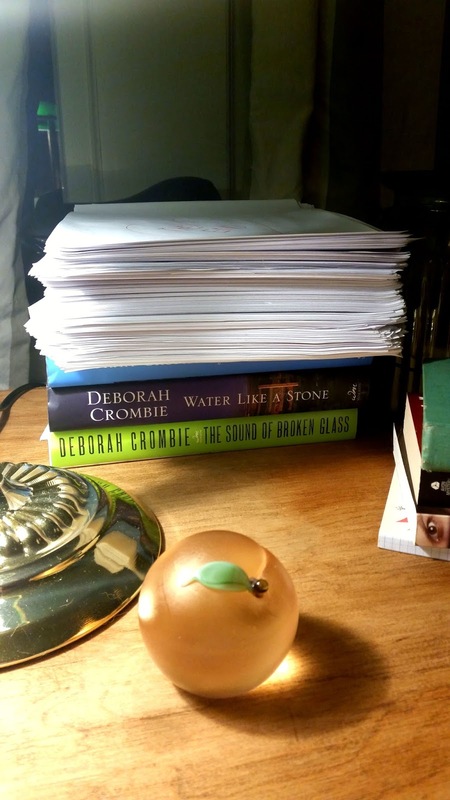 I know I'll see at least some of them in the next book (and hopefully in many more) and I know I'll be doing revisions, and copy edits, and page proofs, so I'll be spending lots more time in this story. BUT IT'S NEVER THE SAME. Once you type that last page, you walk out a door, and your characters go on without you. I guess that answers the "How many books in a series?" question for me. 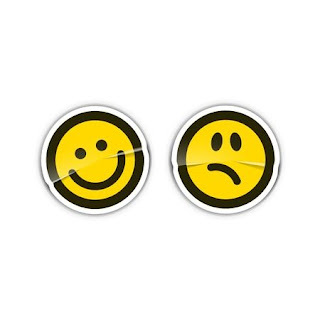 If I ever stop feeling this way, maybe it will be time to move on to something else. But I'm definitely not there yet, and I'm already thinking about what Duncan and Gemma are going to get up to next. REDS and readers, do you feel a bit of postpartum blues when you finish writing--or reading--a book that you love? P.S. I almost forgot the most important part! GARDEN OF LAMENTATIONS will be out February 7th, 2017!!!! Congratulations on finishing “Garden of Lamentations” . . . I’m really looking forward to reading it. 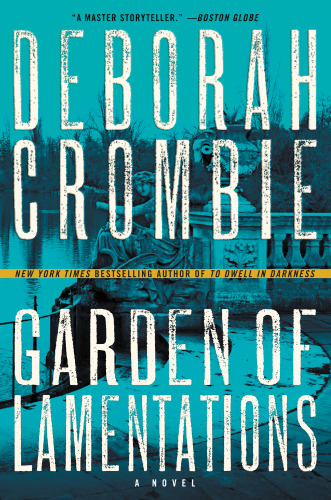 Congratulations, Deborah, on being able to type 'The End' on "Garden of Lamentations". February 2017 still seems a long time to wait, but I am looking for to reading book #17! And yes, as a reader, it can be bittersweet in reaching 'The End', esp. for a high anticipated book. Part of me does not want the story to the end, while the other part is impatiently thinking (hopefully) about the next upcoming book! I know, I know...we can read them faster than the authors can write them, LOL! Well, this *weird* b/c I woke up and was thinking of what to read and I remembered The Garden of Lamentations might be finished this summer (vaca reading), so I decided to check! Congratulations! I'm all set to pre-order! I'm always a little sad when a good book is over, b/c you have to wrench yourself from that world back into this one and maybe there's unfinished business or chacter or theme or place or writing was really wonderful. I get around that by re-reading a lot. Anyways, tapping my tiny toe for February-- Congrats again! I'm glad you added the PS! Feb 7th can't come too soon for me. Congratulations. I don't feel sad when I type THE END. My rough drafts are so rough I know I have to dive right back in and start tidying up all the question marks and [CHECK THIS] notes I leave for myself as I plow through it. Finishing the first draft is really more a moment of jubilation. So I guess I get that melancholy feeling when I finally send it in to my editor. But by then my mind is already moving on to the next book! I definitely feel sad when I read the last book in a series by an author who is no longer writing that series, though - as I felt when I read the last Dorothy Sayers mystery. I knew there would be no more. Or when I finish a really good standalone, like Nancy Pickard's The Scent of Rain and Lightning (although that's coming out later this year as a movie!). So thrilled for you Debs, and cannot wait to read this! OH, Kathy, DO IT! It's my favorite moment. Thrilled for you, Debs - because (seriously) your fans await! Two years' drought between Deborah Crombie's Duncan and Gemma series--waaaaay too long! From a bigtime fan's point of view--but well worth the wait because we all know it takes as long as it takes to get it right. Are there enough cliches in there yet? ;-) Congratulations, Deborah! And, oh yes, serious bit of let-down when something so eagerly awaited is finished. I always tell myself to savor a book like this--read a little bit one day, put the book down and wait until the next day to read some more, etc., to prolong the pleasure. Do I do that? Heck no! Boys--scrounge in the fridge if you want food and can you do soomething about these cats crying for their supper? Phone ringing? Turn it off. It's 2 a.m. and you've got to be at work early? I've looked worse! Lucky for me, February is perfect for a read-in day/night--usually too much snow to feel you need to do anything/go anywhere! How do I feel? Well, as a writer I'm with Edith. I know there is so much work at the end of that Draft Zero that I will be in the story for quite a bit more time. And by the time I've finished the Final Draft, well, I've usually started to see the seeds of a new story, so it's all good. Kathy, I type THE END. There is just something satisfying about knowing that you've gotten to the end of this initial story even if there is more work to be done in revision. Hooray hooray, Debs! That is so great, and we are also proud of you for persevering. Yay! I remember very well when I typed the end when I finished Prime Time. And then I burst into tears. And yes, I do type it now, but not at the end of the first draft. I still do though, burst into tears, or almost, at the end of the final final version.. And actually, that's my signal to myself that I understand that I am truly done. Yes, I always type THE END. It's so satisfying, especially when you've wondered if you'd ever get there. And I am pretty much a one draft writer--that's one of the reasons I'm so slow. I edit and edit and edit, and outline and re-outline and re-outline. I hope I'll get to do one read-through before I get my editor's revision notes, but by that point it's usually nit-picky things and tightening up. Hank, I cried all the way through the last chapter:-) And not because it's a sad ending, I promise!!! FChurch, you described it perfectly! That total immersion in a different world, the one that is so much more compelling than our own. Maybe there's an addictive component to reading a great book that makes us leave our own lives totally, that takes us to a completely different time and space. I just finished reading two new-to-me series, back to back, and had that same "what now"? feeling. When reading series I've long loved and followed as they're written it can be a long dry spell in between, like two years between Deb's. It might be intensified when binge-reading a whole series. I didn't write The End in any of my nonfiction books, but if I ever finish a novel I will totally reward that accomplishment by doing so! And congratulations on your transition back to real life, Debs! I'm so pleased for you, and for us, your loyal fans. Congratulations!!! Can't wait to read this book!! Yes, definitely as a reader I miss the characters at the end/in between books. That's what book series are for! Yay, You!!!!! Congratulations, Debs. I've marked Feb. 7 on my calendar, just as I do for all upcoming books by my favorite authors. Cannot wait! Teri, I find the same thing with audio. I haven't been reading much (actually, anything, new) for the last couple of months because I was too involved in my own story. I have, however, been listening to some old favorites on Audible, and am fascinated by how much more attention I pay to details and the actual prose. It also made me think, as I was writing, how my book would sound being read, which made me pay even more attention than usual to structure and dialog. Cannot wait to hear Gerard Doyle read Garden of Lamentations! Congratulations, Deborah! I knew your work before I knew any of the other Reds, having somehow lucked into finding your books early enough in the series that it was easy to go back and catch up, then devour each new one. So I'm accustomed to waiting for my next visit with Gemma and Duncan. With all the good books I read, I do miss the characters after they finish. Sometimes I go back in a day or two and just re-read favorite passages, or if it is an audio book, re-listen to the final chapters. (Especially when it is the kind of mystery with a big dramatic reveal.) My husband is not much of a reader of fiction, but I sometimes tell him about the characters, or the key parts of the story, just because I need to talk about them. And Deborah, I would add that your books always sound scrumptious in their audio form! Oooh, you just solved the "what does my husband get me for my birthday" question! (Although this book has been pre-ordered on Amazon forEVER! I am so happy to read you'll there will be more books, too. Thank you for every one of them! Congrats, Debs! 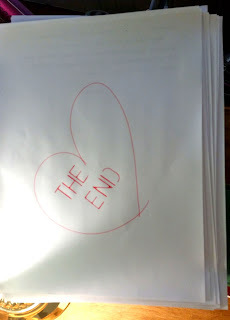 There really are no more joyous words to a writer than "The End." I usually feel so elated when I (FINALLY) finish a book that I'm too high to suffer post-partum letdown. I do become very critical if I reread or listen to the book after a few years. "I should have done this, not that. What a terrible cliche. I could have used a much better metaphor here. All this blah blah blah - why didn't I cut more?" You have made me one happy reader today, Debs! Not only are you finished with Garden of Lamentations, but you are looking towards much more storytelling with Duncan and Gemma. Absolute music to my ears. Congratulations on reaching "the end" with this current book. All your hard work will be appreciated by your many fans. February, with my birthday and other family members' birthdays has always been a favorite month for me, and now it will be even more special. I do have a bit of a let down after finishing the current book in a favorite series, knowing that it will be at least a year for another installment, but sometimes I get lucky with an ARC that cuts the time down a bit. Of course, there is the experience of coming to a series late, after multiple books have been published, and that gives me a continuation experience that is fantastic. I have finally started reading the Ian Rutledge series by the Todds, and with only four under my belt so far, that's a continuation experience I'm thoroughly enjoying. Yay! I'm looking forward to reading this, Debs. Such a great title. I love to sink into a nice, long book. :-) Curiosity: Do you write long first drafts that you know you'll be cutting quite a bit? Or are your first drafts about right, length-wise? Curious because I write bloated first drafts that I know I'll cut by 20% without problem. Cool beans! Garden of Lamentations. I love the titiel. I hate when I finish a book. I mean I want to know what happens to the thrilling end but then it is "what now?" I sat up ridiculously late last night (this morning) because I couldn't put down Elly Griffith's The Ghost Fields. Aw, Debs, can't wait to hear all about it! Great news, Deb!! I don't think I've ever read a 600 page book but there's a first time for everything! That means there's even more of Duncan and Gemma to love! I pre-ordered as usual. 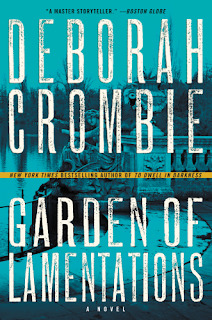 With the intriguing title "Garden of Lamentations", I'm glad you told us that the ending isn't sad!! I'm so happy for your dedication to your craft which allows your fans to step into the fictional world with Duncan and Gemma as their comfortable guides for a period of time away from Wordsworth's "world that is too much with us". Personally, I like to read slowly, savoring each printed word that I know you have carefully selected. Well done, you, friend!! Oh, what an incredible feeling that must be!! Feb 7th: won't forget it, it's my daughter's bithday. This time, I'll get a gift for myself too.Hourray! I'm SO glad you aren't done with Gemma and Duncan. I know writers sometimes tire of their series characters and want to do something fresh and new, but it is sad when that world ends that you are so immersed in and have followed for years. I love this pair and their kids and dogs and cat and their friends. I love Notting Hill and just for a while vicariously being part of England. I am rereading them all right now for the third time and some the fourth. Thank you for sticking with these characters. It will be so hard to wait until February!